Wrong turns, humiliating flops, painful heartbreaks--and happiness? Yes, believe it or not, they can go hand in hand. Blogger and author Mandy Hale, affectionately known as The Single Woman to her half-million social-media followers, is living an adventurous life that proves even our lowest lows and messiest mess-ups can point us toward our joy-filled destiny as single women. 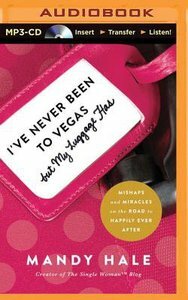 In I've Never Been to Vegas but My Luggage Has, Mandy delivers heart-to-heart, often hilarious stories from a life filled with love and loss, glamour and goose bumps, faith and friendship, big dreams and battle scars. She shares even her darkest moments in witty, winsome ways that make us not only feel her pain, but also laugh with her and apply her hard-won nuggets of inspiration to our own lives. "Happily ever after" might not look or feel quite like what we expect, but it is well within our reach. About "I've Never Been to Vegas, But My Luggage Has (Unabridged Mp3)"